Createspace Independent Publishing Platform, 9781979582698, 508pp. This is the third annual edition of the Long List Anthology. Every year, supporting members of WorldCon nominate their favorite stories first published during the previous year to determine the top five in each category for the final Hugo Award ballot. 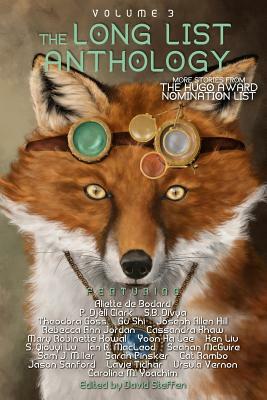 This is an anthology collecting more of the stories from that nomination list to get them to more readers The Long List Anthology Volume 3 collects 20 science fiction, fantasy, and horror stories from that nomination list, totaling over 500 pages of fiction by writers from all corners of the world. From intelligent appliances gone feral to Lovecraftian detective noir, from tech-enhanced wilderness races to Egyptian science fantasy steampunk, from hard science fiction to fairy tale to humor and more. There is a wide variety of styles and types of stories here, and something for everyone. The stories included are: "Red in Tooth and Cog" by Cat Rambo "A Salvaging of Ghosts" by Aliette de Bodard "Welcome to the Medical Clinic at the Interplanetary Relay Station Hours Since the Last Patient Death: 0" by Caroline M. Yoachim "Razorback" by Ursula Vernon "We Have a Cultural Difference, Can I Taste You?" by Rebecca Ann Jordan "Lullaby for a Lost World" by Aliette de Bodard "Terminal" by Lavie Tidhar "Ye Highlands and Ye Lowlands" by Seanan McGuire "Things With Beards" by Sam J. Miller "The Venus Effect" by Joseph Allen Hill "The Visitor From Taured" by Ian R. MacLeod "Blood Grains Speak Through Memories" by Jason Sanford "Sooner or Later Everything Falls Into the Sea" by Sarah Pinsker "A Dead Djinn in Cairo" by P. Dj l Clark "Red as Blood and White as Bone" by Theodora Goss "Foxfire, Foxfire" by Yoon Ha Lee "Forest of Memory" by Mary Robinette Kowal "Chimera" by Gu Shi, translated by S. Qiouyi Lu and Ken Liu "Hammers on Bone" by Cassandra Khaw "Runtime" by S.B. Divya. David Steffen is editor of Diabolical Plots and the Long List Anthology Series and administrator and co-founder of the Submission Grinder, a tool to help writers find publishers for their work.